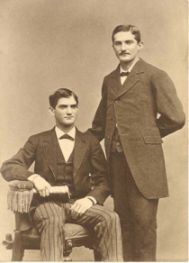 T he Cone Mills Corporation was established in 1891 when brothers Moses and Caesar Cone decided to enter the textile business in the South, where for more than a decade they had been wholesale grocery and tobacco distributors. Finding that the bolts of cloth from local mills they often received as payment sold easily, the Cones saw the potential for textile production and bought an interest in cotton mills in Asheville, Salisbury, and Gibsonville. They perceived the need for a better product than the loosely woven fabric they had been receiving in trade as well as for a strong marketing organization in a glutted industry suffering from cutthroat competition. The Cones obtained a New Jersey charter for the Cone Export and Commission Company, which was first headquartered in New York City but later moved to Greensboro because of communications facilities and proximity to producers. By the mid-1890s, the Cones' company was serving approximately 90 percent of the South's mill owners. It saved a number of mills from going under in the hard times of the 1890s and helped manufacturers improve product quality. In 1941 the company's headquarters returned to New York City as its operations broadened. 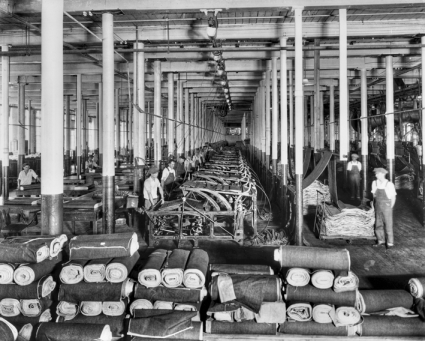 During the decade between 1895 and 1905, the Cones entered direct manufacturing of denim-their giant White Oak plant near Greensboro opened in 1905-and helped build the South's first cotton flannel mill, the Revolution Mill, which operated until 1982. They would subsequently diversify into printing and other textiles and processes, buy controlling interest in several mills, and build several mill villages. The corporation remained profitable throughout the Great Depression. World War II saw the production of a variety of fabrics for the armed forces, leading Cone Mills to be honored with the coveted Army and Navy "E" Award. During the war a Cone subsidiary leased 512 acres of its property in the northeast section of Greensboro to the U.S. Army for construction of Basic Training Center No. 10, later called the Overseas Replacement Depot. The army's presence bolstered Greensboro's economy and later aided the city's adjustment to peacetime. A publicly traded company for more than 30 years, Cone Mills went private in 1984 after threats of a hostile takeover. In 1991 the company celebrated its centennial. Although the challenge of imports and economic recession led to continuous restructuring and changes in operations, in 2002 the company remained one of the nation's largest manufacturers of textiles and related products and a world leader in denim manufacture. A 2002 ranking listed Cone Mills Corporation at number 70 among the state's top 100 companies, with an estimated market worth of $78.9 million. The company was purchased in 2004 by New York financier Wilbur Ross and became, along with Burlington Industries, part of the giant International Textile Group, headquartered in Greensboro. Carolyn R. Hines, ed., A Century of Excellence: The History of Cone Mills, 1891 to 1991 (1991). Moses & Ceasar Cone. Available from the Encyclopedia of Southern Jewish Communities. Available from http://www.isjl.org/history/archive/nc/greensboro.html (accessed October 3, 2012). 1 January 2006 | Stoesen, Alexander R.